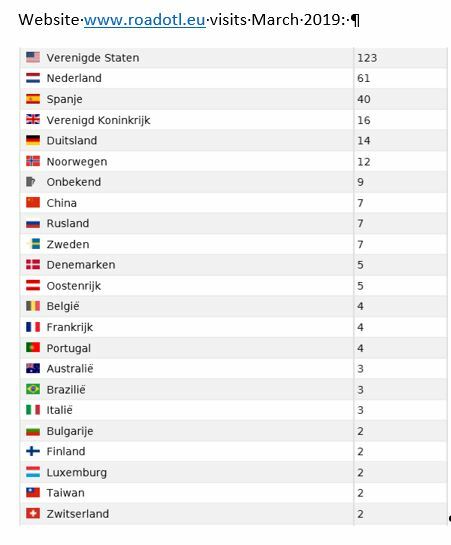 Our website is visited from countries all over the world. 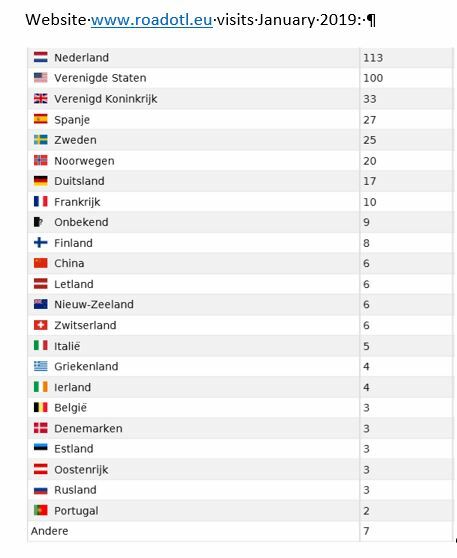 Are you one of our visitors? Please contact us if you have any suggestions or remarks. Since 2016 we, as the consortium INTERLINK, have successfully developed the EUROTL Framework using Linked Data / Semantic Web technology. We tested this in three testcases: in Germany, the Nordic Countries and the Netherlands. You can read and download the results of our EUROTL framework via this website. You can also read and download our OTL ontologies and used datasets for the testcases. Via the website you can see our OTL-video as well. We have disseminated our results from 2016 until today on different conferences in Europe and on the buildingSMART summit in Tokyo in October 2018. On this buildingSMART summit in October 2018 we received the buildingSMART 2018 Distinction award for our project. You can find our presentations on our website. We have now added our final report about the CEDR-INTERLINK EUROTL Approach with basic European Road OTL on our website as a so called ireport. In the final report, you can read “How to start” with a gradual step-by-step hybrid transition to the use of this European Road OTL. From now on we are working on adoption of our approach within the National Road Authorities. Several NRAS are interested to start with the CEDR-INTERLINK EUROTL Approach with basic European Road OTL. We are also working on international standardisation of our principles, as laid down in the modelling and linking guide via the ISO and CEN. The CEN TC 442, WG 4, started with TF3: Building Information Modelling (BIM) - Modelling and linking between semantic ontologies, based on the INTERLINK MLG, especially the top level of the domain ontologies. We also have good hopes that we can introduce our modelling principles in the Dutch construction industry. Read our results and please, spread the word. Use our website www.roadotl.eu as a reference. Any feedback, positive or negative, is welcome. If you are interested and need more information you can email or call us. See the website “contact” or the final report “About” for our email and phone numbers. We hope to keep in touch with you for the further adoption of the European Road OTL. The Final I-report is now available on our INTERLINK website with a chapter "HOW TO START". 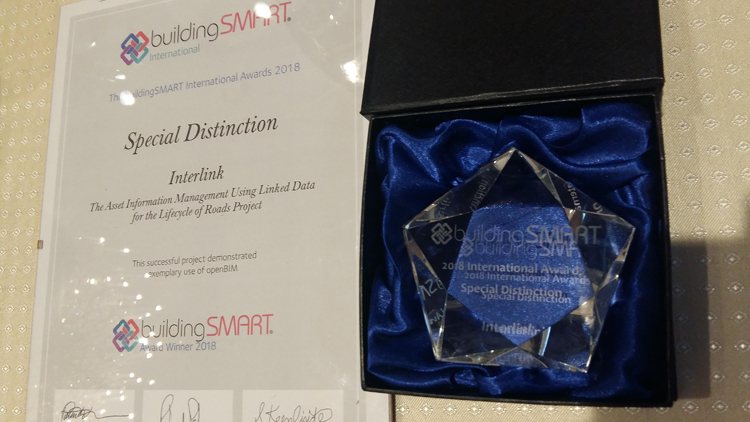 INTERLINK has been announced as the winner of the Special Distinction 2018 buildingSMART Special Award for its application of BIM in a major international road asset management project. 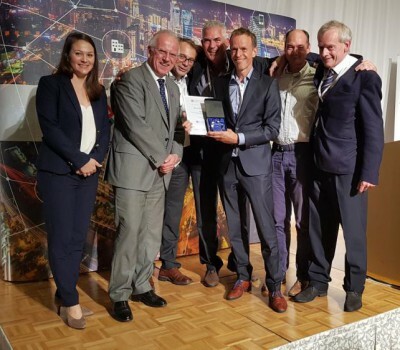 INTERLINK was selected to win the award for its digital ways of working within a two-year research project for the Conference of European Directors of Roads (CEDR). INTERLINK is now engaging with the National Roads Authorities of the 26 European members of CEDR via a series of roadshows, as well as industry representatives including contractors, academics, consultants and software developers, to share the results of the project. Daan Alsem, as INTERLINK member Royal HaskoningDHV, said: “We’re thrilled to have been selected to win this prestigious award. This has been a significant development for our industry and it’s highly rewarding to have our work celebrated in this way. The buildingSMART award organisers reported a record-breaking number of submissions for the 2018 awards. Winners were announced at the International Standards Summit in Tokyo on Tuesday 16 October 2018. 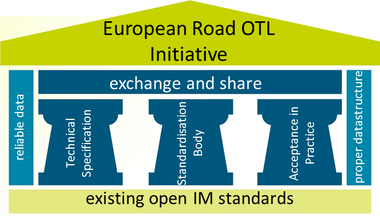 Development of an European Road OTL and open exchange standard. In September 2016 INTERLINK commenced a two-year CEDR (Conference of European Directors of Roads) research project into the use of BIM (Building Information Modelling) for information management during the delivery and operation of civil infrastructure. The consortium commissioned for the project, entitled INTERLINK, comprises a research institute (TNO from the Netherlands), engineering and asset management consultants (ROD from Ireland and Royal HaskoningDHV from the Netherlands), ICT consultants and software companies (AEC3 from Germany, Trimble Solutions Sandvika from Norway, interactive instruments from Germany, and Semmtech from the Netherlands), and a national BIM implementation body (planen-bauen 4.0 from Germany). TRA2018 Vienne, A digital era for transport solutions for society, economy and environment.